A number of studies present cross sections of the Cape Fear interval that include geophysical logs (gamma ray, spontaneous potential) (Colquhoun and others, 1983; Aucott and others, 1987; Temples and Waddell, 1996). These logs are a source of semiquantitative estimates of sand thickness in the Cape Fear interval. 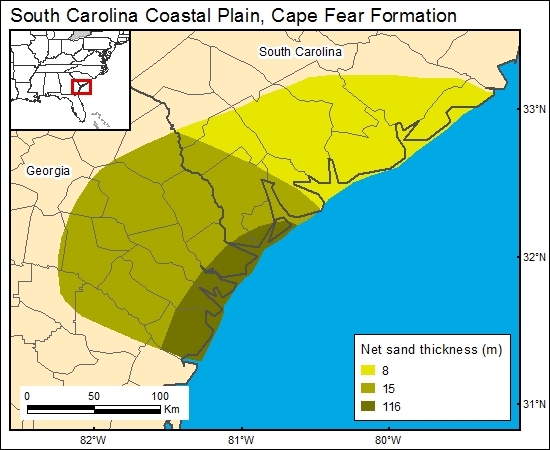 Brown and others (1979) provided actual sand thickness for the Cape Fear interval (their Unit E), but these estimates are from wells in Georgia. Gohn and others (1977) presented results of textural and mineralogical analyses of the Cape Fear Formation conducted on samples from a well near Charleston. Their analyses indicate that the Cape Fear interval is primarily silt, but there are some sand intervals. Sand-thickness estimates are considerably lower than estimates derived from the geophysical logs (which are typically 50 ft). We attribute the difference to the geophysical-log response to silt intervals being similar to that of sand. Temples and Waddell (1996) reported that for the Middendorf and Cape Fear aquifers in southeasternmost South Carolina, between 2,770 and 3,763, there is 381 ft of aquifer sand. Brown and others (1979) determined that the sands in the Cape Fear interval (their unit E) in Georgia generally range from 40 to 58, with an average of 49. We attribute the thicker sands in southeasternmost South Carolina and in Georgia to a deeper basement and thicker Cape Fear interval. For the GIS we combined sand-thickness information of Gohn and others (1977), Brown and others (1979), and Temples and Waddell (1996).